The mobiles, tablets, laptops have become an inseparable part of our lives. A simple thought of having a ‘low’ battery or ‘near-dead’ battery for any of these devices may actually lead to hypertension in most of us. The power banks have succeeded to some extent in saving us from this situation. However, they too need to be charged on a regular basis to be of any use. Imagine a situation when you need to go off-grid or in the wilderness where power supply may be an issue or simply when your reliable power bank is either drained or already spent out. What happens then? Relax! Help is at hand. Just look up in the sky and you will find the answer. 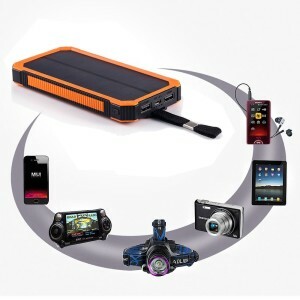 Welcome to the world of Portable Solar Chargers the latest entrants in the world of gadgets. These humble devices have also transformed themselves from their earlier avatar to keep up pace with our communication devices. 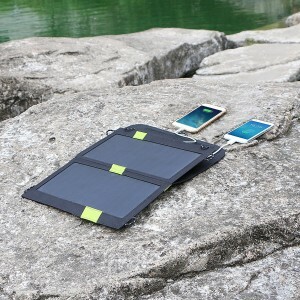 The Portable Solar Chargers are fast getting traction due to its ‘power-on-the-go’ feature. Just like a photovoltaic power generation unit employed at home or in a commercial project, this device too is based on the same concept. 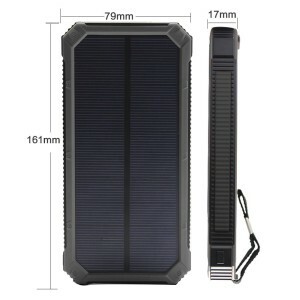 A Portable Solar Charger broadly has three components viz; solar panels to catch the sun-rays, electronic circuitry to convert the electricity produced to be used effectively for charging purpose and a casing that ensures mobility. 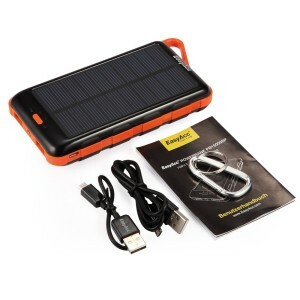 Some Portable Solar Chargers are also connected to a power bank so that the electricity so produced can be saved for future use. The use of lightweight material of construction ensures that the device can be lugged around easily without any fuss. So, how exactly do the portable solar battery chargers become our ‘savior’? Read Also about best top 10 power banks here. Take your pick from some of the best Portable Solar Chargers currently available today. 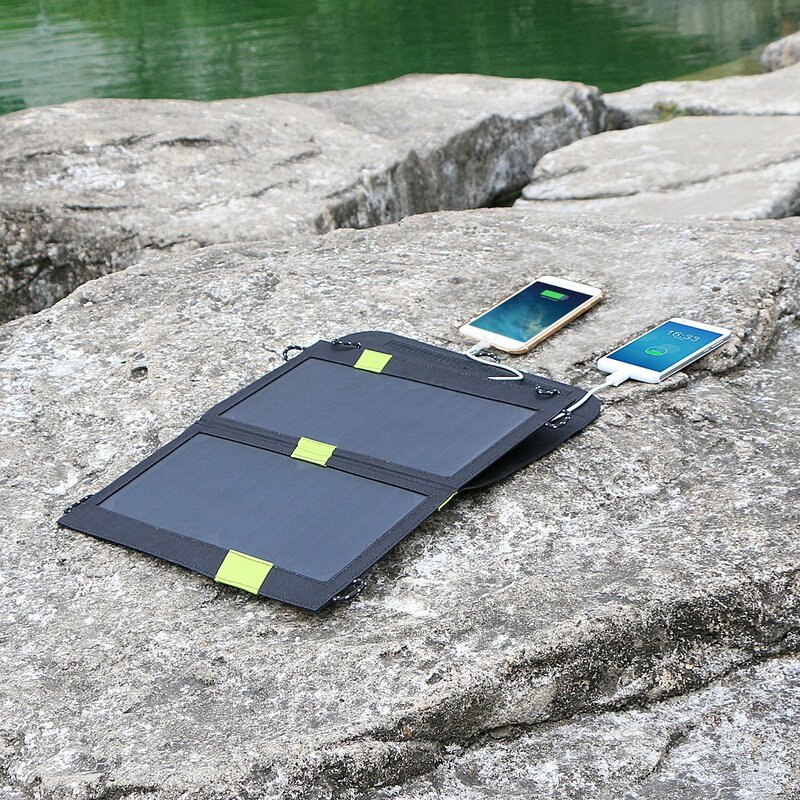 This 3 paneled foldable Portable Solar Charger is a ‘plug-and-play’ charger. It does not have any power bank, hence your device needs to be directly connected the USB output. The Anker PowerPort 21W comes with three industrial strength PET polymer faced solar panels neatly sewn in rugged polyester canvas making is an all weather device. The fast charge technology ‘PowerIQ’ delivers quick charging with speeds up to 2.4 amps per port or 3 amps overall under direct sunlight. Weighing slightly more than 400 Gms, the PowerPort measures 11.1 x 6.3 inches when folded and 26.4 x 11.1 inches when opened making it quite compact. It also has eye-holes on its corners so that it could be hung on a tree, tent or backpacks. The device also comes with a 3 feet long micro USB cable and 18 months warranty making it a reliable proposition. The built-in short circuit and surge protection technology keep all the connected devices protected against any damages. While the PowerPort Solar is compatible with all Apple and android phones, i-pods and certain other devices cannot be charged whit it. The PowerPort is available in a range of 4 output ranges – 21W, 15W, 14W and 8W. Choose one depending upon your device requirement and never bother about being left ‘high & dry’ on your next adventure. The ZeroLemon SolarJuice is a powerhouse when it comes to recharging. Delivering a 20000mAh charge, enough to charge two devices simultaneously, the ZeroLemon is your savior when you are offgrid. Being the worlds largest capacity charger, it keeps on recharging at all times ensuring that you don’t run out of any juice when needed. A highly compact, portable and stylish design allows it to fit into your backpack or be just hung on it or a tree or a tent if required. The dual USB ports allow simultaneous fast charging of your mobile phone and tablet. Equipped with emergency LED flashlight, this device can come in handy in your camping adventures or in emergencies elsewhere. Top Grade A LI-polymer cell, that charges with the help of 1.2W mono-crystalline solar panels makes it amongst the most efficient design in the market today. The battery is anti-explosion and offers recharging upto 1000 times against the conventional 500 times. The ZeroLemon SolarJuice is your ultimate partner in your outdoor jaunts. One of the sleekest Portable Solar Charger in town, the iBeek has a powerful built-in power bank which is continuously charged whenever the solar panels are exposed to sun. 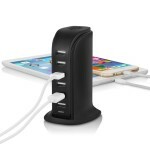 The iBeek has 2 nos of 1.0 USB ports to allow charging of two of your devices simultaneously. The iBeek is can support 2 devices with a 5V/1A-2.1A input requirement making it ideal for most handheld communication devices like mobile phones and tablets. It also has an LED flashlight for emergency use in darkness or inside your tent and an SOS mode for getting emergency help. The best part of this device is that it comes with a hook, with which it could be easily hung to your backpack. This ‘easy-hang’ feature allows complete freedom making it a perfect partner for your hiking, climbing or outdoor activity. The iBeek is designed to be rain-proof, dust-proof and shock-resistant making it sturdy enough to partner you on all your outdoor adventures. The built-in polymer battery is anti-explosion, lightweight, compact and reliable with a long lifespan of up to 500 recharging cycles. With dimensions of 16 x 7.9 x 2 cm and weighing just 220 gm, the iBeek is an ideal outdoor partner. Choose from three different colors – the usual Black, green or Orange, you are ready for a style statement too. 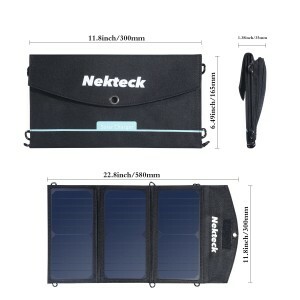 Just unfold the three solar panels and the NekTeck 20W Solar Charger comes into action. It can be tied to your backpack or hung on a tent or tree to make it an ideal outdoor partner. The dual USB output ports allow simultaneous charging of two devices (max 2A per port or a total of 3A simultaneously). The SmartIC technology identifies the power specs of the connected devices and accordingly gives the output to fast charge the connected device. Weighing just 567 Gms, this device measures 11.8 x 6.5 inches when folded and 22.8 x 11.8 inches when opened making it ultra compact when you need it. The panels are fitted in woven canvas making it rugged enough for outdoor use. This charger is compatible to most apple products, android devices, GPS, digital cameras and other hand-held devices. Probably one of the lightest dual port PCS in the market that delivers a powerful 15000 mAh charge, this devices is capable of charging two devices simultaneously. Since the casing is made of ABS, this PCS weighs just about 340 Gms. 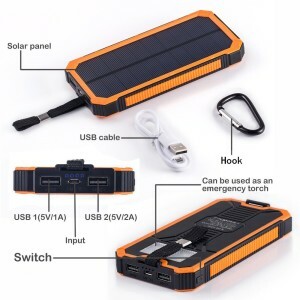 It can act as a power bank when connected to the electrical wall socket and when disconnected, the solar panel comes into action ensuring that the power bank is always ready to use. 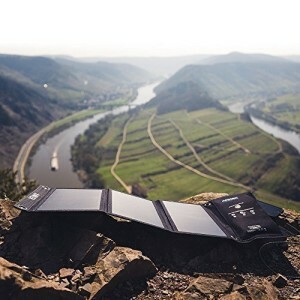 Stylish and compact and lightweight design makes this Portable Solar Charger the preferred choice of adventure enthusiasts. The high quality Li-polymer battery can easily outlast over 500 charging cycles. Being made with ABS, this Portable Solar Charger is virtually rain, shock and dust proof ensuring an all weather performance. The built in 6-LED flashlight is enough to cut through darkness or light up a tent making it an ideal partner for outdoors. This power packed performer measures just 11 x 4.5 x 1.5 inches making it the best in its class. This multipurpose device is amongst the most compact devices in town. It can be charged via a solar panel or could be connected to an electricity source. The powerful 15000 mAh Li-Polymer battery ensures that you stay charged always. The dust-proof outer casing protects the charger and its panels in most weather conditions. The dual USB ports (2A and 1A each for tablets and mobiles respectively) can be deployed simultaneously. The charger automatically studies the connected devices’ power requirements specs and delivers an output accordingly. 4 integrated LED show the power status while the 6 LED flashlight makes it a perfect partner for beating the darkness around. This Solar Power Bank can also be charged by plugging it into a wall socket or your car’s charger. All it needs is a DC5V/2A charge to be ready. The hook accompanying the charger allows the user to move around by hanging the charger to the backpack or to a tent, tree when resting. This compact device measures 7.5 x 4 x 1 inch and weighs just 360 Gms. The X-Dragon 14W comes with 2 solar panels that offer up to 22-25% conversion efficiency. This is far higher than efficiency offered by most products available in the market today. 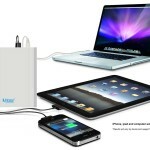 The dual USB power output provides adequate power to charge a cell phone and tablet simultaneous. Its slim, foldable and easy to carry around design makes the X-Dragon an ideal partner for all yours outdoor adventures. With 4 eye holes and the edges, the X-Dragon can be hung on backpacks, trees or tents. The X-Drive comes with the exclusive iSolar technology that can automatically adjust the current and voltage to achieve maximum power thereby delivering the fastest possible current of up to 2A under direct sunlight. This makes charging your device a breeze. With the dimensions measuring 13 x 7.7 x 1.4 inches, the X-Dragon weighs just over 500 grams. Available in configurations of 8W, 12W, 14W, 16W, 20W and 28W, the X-Dragon is a completely dependable partner for all your recharging needs when you are off grid. When it comes to spces, this device should appear towards the top. 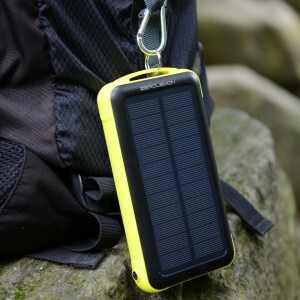 For an output of 15000 mAh, this Portable Solar Charger weighs just 353 Gms! With a compact size measuring 5.6 x 3 x 0.9 inches, this arguably is the slimmest devices delivering a 15000mAh punch. A built-in flashlight and a carabiner facility makes it easy to in the dark and also to hang it on a back pack, tent or a tree. Dual USB allows for charging of two devices simultaneously on-the-go. Connect just about any smart device and roam worry-free. Amongst the most efficient solar chargers delivering upto 22-25% conversion efficiency, the Choe 12W is a sturdy performer. Its unique Auto-Detect technology identifies your device’s power specs and delivers a charge of up to 1.8A to recharge your device in the fastest possible time. The solar panels are encased in sturdy and all-weather resistant polyester canvas making it a solid partner. Its compact size measuring just 15.9 x 9 x 0.5 inch when opened and 9 x 6.1 x 0.5 inchs when folded makes the Choe a compact player. Well placed eyeholes allow it to be hung on your back-pack, tree or a tent ensuring that it stays portable. The max power output possible for this device is 5v/1800mA. The dual USB allows for simultaneous recharge of two of your devices. 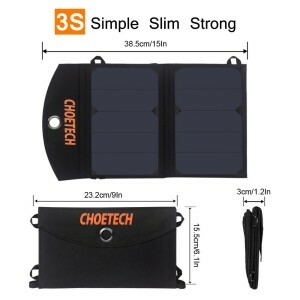 Weighing just above 300 Gms, the Choe 12W dual USB Solar Cell Charges is your “go-to” device anytime.